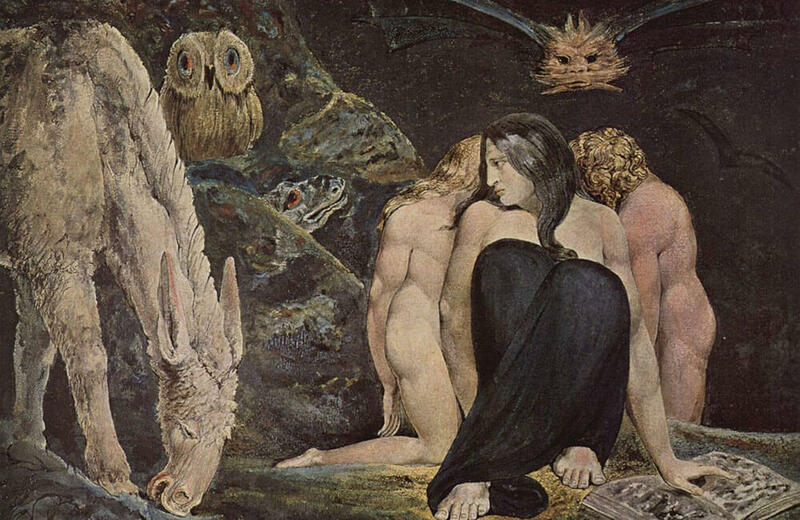 The Night of Enitharmon’s Joy by William Blake, a reference to the triple Fates of Greco-Roman mythology from whence the Weird Sisters evolved. This week we move from tomorrow being a drag to me attempting to do the voices of three witches. This is the famous and oft reimagined scene from Shakespeare’s tragedy Macbeth, where a Scottish king with an overly ambitious wife stabs his way to the throne, contains one of the most recognizable archetypes of the witch in the Western world. Words and a bit of translation from Shakespeare – modern below. Then scroll down for the witchy story. A shout-out to InspectorJ and FlatHill on Freesound.org for the rain and thunder. Act 4, Scene 1. A cavern. In the middle, a boiling cauldron. In the poison’d entrails (intestines) throw. Lizard’s leg and owlet’s wing (baby owl wing,). Then the charm is firm and good (‘blood’ and ‘good’ actually used to rhyme). Act I, Scene I. A desert place. Upon the heath (a little hillock where the witches meet, ‘heath’ being the root of ‘heathen’). For the record, I tacked on the Weird Sister’s Fair is foul… lines from the opening of Macbeth to the end of the famous Double Double bit from Act 4, Scene 1 because I like those lines and it added a sort of finality to the scene, as if the witches were having a session, and I wanted a bit more witchy interplay at the end, kind of implying that they’re voices from the same wily consciousness. I first recited this scene from Macbeth with the Weird Sisters when I was in high school. We had to pick a random scene from the play (other than Macbeth’s famous soliloquy) and set up a time to recite it. I showed up after school and did the entire scene as basically one witch, the mad-cap, hi-frequency one in this recording (Witch #2). I was younger and my capacity to do hi-pitched, squealing voices was a bit more expansive than at present. On that, I learned this week that when I do a character, it sounds very different in my head than it does when recorded. I’ve been reading Terry Pratchett’s Witches series to my daughter over the past months and I thought my Granny Weatherwax and Nanny Ogg were pretty damn good. Over the course of the past week, however, I casually dropped to a few friends that my next project would be the Macbeth witches, and that I already had the voices for 2 of them, though I was struggling with the 3rd. I confidently reeled off a few lines with my outstanding witchtones to a few friends, who looked a bit sceptical. I was surprised to find out that the two witches I had ‘figured out’ sounded much more, well, mannish, once I finally recorded myself doing them (well, natch). Hi-pitched Witch #2 came out pretty well, with a few adjustments, but Witch #3 (who I fancied would sound a bit bullfrogish) came out sounding like a Sith Lord and Witch #1 (the one I hadn’t figured out) ended up as a modified Granny Weatherwax. All things considered, I suppose for a man with a relatively deep voice endeavouring to record three women doing witch stuff, I did OK. I’d have loved to perfect the voices a bit more, but I was literally re-recording for about 5 hours and my voice was so strained and cracked that I was happy just to be able to get all three ladies recorded in some form. Perfect is the enemy of done! Funnily enough, in Shakespeare’s time the witches would certainly have been performed by men, as women were forbidden from the acting profession, as we saw played out in the ingenious and endlessly re-watchable Shakespeare in Love. I also played the characters up as a bit comical, and I was gratified to find that this was a pretty good interpretation. Modern depictions of the Weird Sisters have often tended towards the horrific and morbid, as in Roman Polanski’s 1971 film where they’re part of a huge, naked-lady cult, or the 2006 Australian Macbeth there they’re goth chicks wrecking a cemetery, or the 2010 BBC Macbeth where they’re battlefield nurses who chant over bodies in a morgue. As with any great Disney villain, the witches must be as comical and charming as they are horrific: the audience likes them despite their propensity for trickery and evil. The Weird Sisters aren’t – strictly speaking – women at all, and I’ve played them as having dubious gender. The final result is that Witch #1 is the understated leader, Witch #2 is batshit-crazy, the Weird Sister that makes the other two exchange worried glances, and Witch #3 is a pop-eyed, bullfrog-voiced hag-monster that snatches flies out of the air with her prehensile tongue (metty-forically speaking). The witches are very similar to the three Fates of Greek mythology, the Moirai from which they’re descended, who drew out the skein of people’s lives at birth and arrived to clip the thread when those lives were over. In fact, in Old English the sentiment of ‘fate’ was the word ‘Wyrd’, and hence the name in the context of Shakespeare. It’s funny, because the witches give Macbeth ambiguous predictions about the future, which he interprets as marks of a destiny they never assure him of. Is it Macbeth’s fate to be King of Scotland, or are the witches pushing him into his tragic, murderous future? Though most often depicted as old hags, the Moirai also relate to the Triple Goddess of maiden, mother and crone, symbolised by the waxing, full, and waning moons respectively. This is the version of the story depicted in Pratchett’s Witches books I mentioned above. The first of these, Wyrd Sisters, is loosely based on Macbeth and is chock-full of gags related to the play. The opening scene of the book is even a rough facsimile of the opening of Macbeth and the ‘When shall we three meet again…’ line. The ‘crone’ of the series, Granny Weatherwax, is one of Terry Pratchett’s best inventions, a ‘wicked witch’ who’s unapologetically proud of her witchy countenance and old lady power. My daughter thinks she and Nanny Ogg (the ‘mother’) are infinitely cool and admires them to no end when we read of their adventures (the second of which is loosely based on A Midsummer Night’s Dream, also Shakespeare. I can imagine fewer good examples of accessible feminism than Granny Weatherwax and her unconditional belief in herself and her own abilities. Audio Project #1 This image was taken from copyrighted material and used on the assumption of Fair Use, in an act of homage to a movie of which I'm a fan and which I'm promoting. No profit is being made from it. 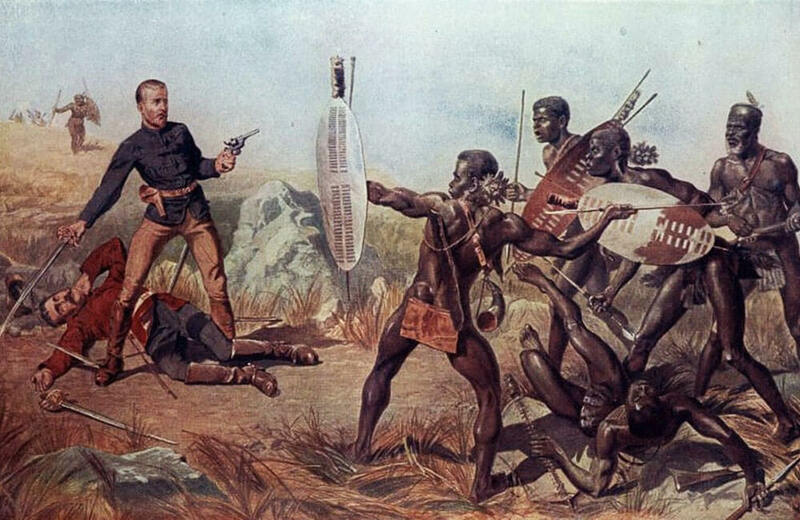 Public Domain, from Wikimedia Commons Deny Your God!